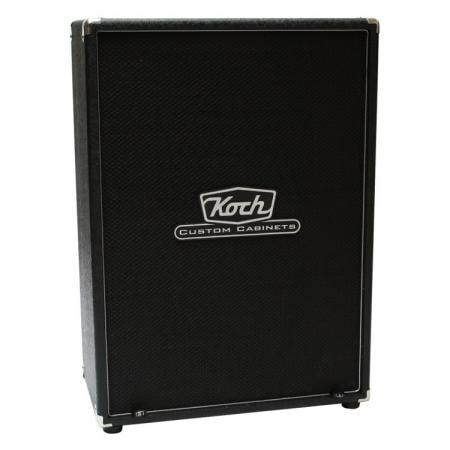 Koch KCC212 V cabinet overview. Our KCC Series speaker cabinets are the ultimate guitar extension cabinets. Designed specifically to match all our amplifiers, the KCC speaker cabinets feature void free multi-ply baltic birch construction, sealed back and special bracing and tuning for optimum guitar sound reproduction. All our speaker cabinets are internally wired with the new Koch Dynacon speaker cable for sparkling highs, tight bass, and a warm mid response. The result is a series of stunningly lively cabinets with a huge soundstage and a natural sound experience. Due to our baffle mounting-system, the speakers are front or rear mountable. Front speaker mounting gives you an incredible direct sound, straight in the face. Great response and really tight. A good choice if you are a speed-picker who is looking for lots of definition. Rear speaker mounting will give you a lush sound. A little less hi-fi, a little more brown. Fat low end and fantastic mid range. All our combos and cabinets are standard equipped with Koch speakers. In our never ending quest for perfection, we realized that not only the amp design, but also the speakers are an essential part of the total sound experience. Currently, we have three models the VG12-90, The VG12-60 and the VG10-25. The VG12-90, used in these cabinets is already known for his sweet tone, bell-like highs and astounding bass response. At low and also at high volume levels the VG12-90 excels in all music styles. Our own design speakers are the perfect match for all our amplifiers. 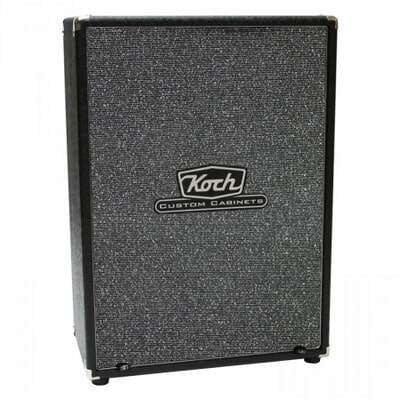 Koch KCC212 V cabinet specifications.